These Disney gel gems acts as a home decor for your kids’ room. Generally kids will be more attracted to the characters which are seen in the cartoon pictures. They feel that character as their friend and try to pretend like that by imitating those characters. 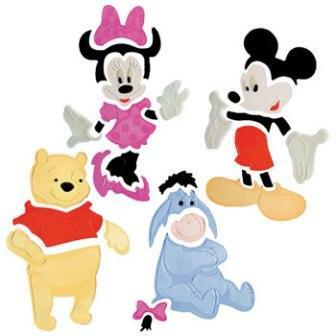 Make your kids more delighted by placing these Disney characters as wall decors in their room. Generally the kid’s room has to be decorated in such a way that it looks more attractive with bright colors featuring on all the aspects present in the room so that your kids will be refreshed by seeing all the beautiful colors and arts present in their room. These Display Disney characters are adorable and reusable Disney Gel Gems. Of course, these are not meant for kids’ room only, You can stick them at any place in your home like on your windows, refrigerators, mirrors – virtually any non-porous surface! It’s fun, safe, and easy to use. There are various types of characters available in this Disney gel gems. You can select anyone depending on your kids liking and preference, whether it may be Mickey, Minnie, Winnie the Pooh etc. These Disney gel gems will delight children of all ages. Each and every character of these Disney gel gems will be sold separately. So, you can select whichever you want and the dimensions of each Disney gel gems are 13″ x 10.25″. Previous articleWindow Decoration To Spruce Up Your Weary Windows!